A belfry (Belfort in Dutch, Beffroi in French) is a building (also known as a bell tower) - or a part of a building - in which bells are hung. 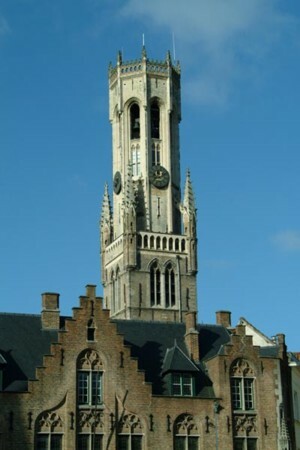 The mediaeval (13th-15th century) belfry tower of Brugge (or Bruges) is 88 metres in height and houses the former city treasury, in which Bruges' valuables (money and royal charters) were once kept. A climb of 366 steps takes the visitor past the impressive clock mechanism and culminates in a breathtaking panoramic view of the city and its surroundings. The famous 47-bell carillon is also located here.